YummyTaters wrote: Thanks for the thread! 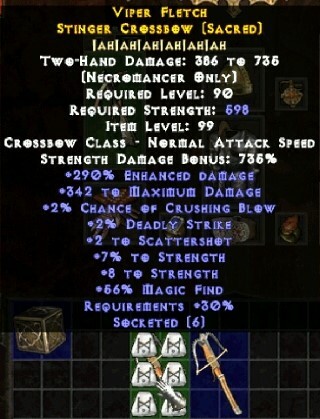 I started out with a crossbow necro but hit a brick wall just before 120, this guide gave me some inspiration and item ideas to get over that hurdle. I'm just about to hit level 122, and looking to upgrade some of my gear. Gloves and Boots will probably be easiest I'm thinking since those are sacred crafts. 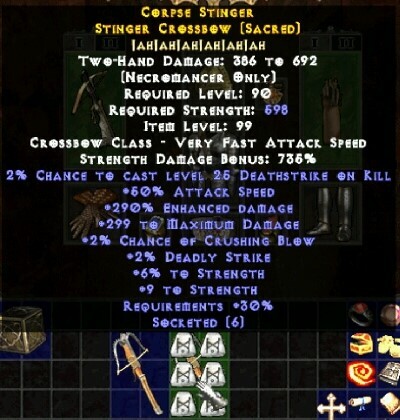 I haven't found a crossbow to craft yet. What stats are best to look for when doing crafting? ctc widowmaker, max damage(200+), high ED/strength/flat strength are all good but mainly the first 2. Note that widowmaker on kill only spawns on non-necro only crossbows. If you're not using one of the SUs yet, then you should definitely try to find a Stinger crossbow or Trebuchet to craft with. Just oll it with good damage (few hundred flat and some ED) and it will already outperform Starkiller. Later on when you're looking for a tasty craft, you'll want high max damage (300+), some ED% (anywhere 70+ is fine) and a good proc (Knife throw/Time strike on striking or Shower of Rocks/Spike nova on kill). Necro skills and MF are a bonus on top. Depending on the amount of ED the weapon has, use either Intimidating/Weird shrine (if ED<170%~) or Creepy shrine to bless it. How do you guys reach 25k+ attack rating? I just hit lv 120, and my ar is 11000. I almost got every charm till lv120, put 150~200 dex. Should I fill every sockets with ar% jewels? Edited by aquafresh 2 months. aquafresh wrote: How do you guys reach 25k+ attack rating? I just hit lv 120, and my ar is 11000. I got almost every charm till lv120, put 150~200 dex. No need to fill every socket, but AR% jewels do help tremendously. Anyone tried the Achilios set with this build? Is it worth it? Wuhrfrahmen wrote: Anyone tried the Achilios set with this build? Is it worth it? conveee wrote: there is no need to reach 50k ar, 25k-30k ar is enough for endgame, which you can get with charms, few %ar jewells and some points in dex. I disagree. I tried with 30k AR and 50k AR and with 50k I find 125+ challenges a lot easier and faster. what shines did you use for blessing ?